Say yes to convenience, make vista folders more informative! Modern computers can store terabytes of information. The number of folders in which you keep all your files increases, and you inevitably find yourself exhausted from the necessary folder among tons of others. Even the neat design of Vista folder icons cannot help when there are too many Windows file folders. How do we keep navigation as smooth as possible? The answer is simple: follow the intuitive visual approach with Everyday Folder Icons. It's the biggest and most diverse Vista folder icon pack there has ever been with icons of impeccable quality. Now a well-planned hierarchy, along with fitting folder names isn't the only way to provide better navigation – change folder icon of any Vista folder you often use for even more tangible results. If you come to think of it, Windows Vista, providing as much freedom as it does, still lacks the essential assortment of directory icons. In the standard case, you have to look for the necessary icons all over the disc, while with Everyday Folder Icons you'll find them all in one place for every possible occasion. It is fairly convenient. Folder becomes unique after you change folder icon with Everyday Folder Icons, so that it makes extremely easy to find all your favorite folders thanks to their new eye-catching and stylish appearance. Good things do come in big packages! Everyday Folder Icons has the biggest choice of Vista folders you can find on the Web, and yet it continues to grow rapidly because you can never have too many of those lovely folders. With such a wide range of folder icons, you can find a matching icon for almost any type of folder. Still, if your fantasy craves more, you don't need to look for icons elsewhere as it's very easy to order a personal and absolutely unique icon for only $9.95 and get it crafted by highly qualified professionals. Anytime you have a feeling to change a folder icon – just remember Everyday Folder Icons. Each icon from Everyday Folder Icons is designed to look impeccable in all sizes, including 16x16, and fit the authentic folder style of the original Vista folders. Refined appearance and perfectly fitting style is what makes you feel the difference between icons available at no charge and a carefully crafted collection delivered by the experts. These icons are true masterpieces of desktop folder art and certainly deserve to become the new look of all your favorite folders. Label your folders with these classy icons to make your navigation more convenient and efficient. Everyday Folder Icons will be a fine purchase on its own. However, it will be especially convenient to use this icon pack along with Folder Marker. It's the smart folder highlight recipe and the fastest way to personalize your desktop. The way your folders look can be changed in seconds. Use this tool to assign another icon to any given folder in just two clicks. Thus, Folder Marker users will get extra benefit from the rich icon pack, as they'll be able to shift folder appearance in an instant and try out the variety of icons with no delay. 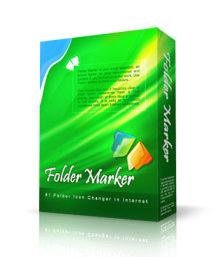 At present, Folder Marker is the #1 icon changer on the Internet with a wide range of colored folders and colors. Replace the boredom of standard folder icons with colorful folders for better perception!